An unusual visitor to Gravesend was Handley Page Heyford III K5187, which flew with 102 and 149 Sqns and was struck off RAF charge in 1940. Percival Mew Gull G-ACND is the subject of photo 2. First flown in March 1934, powered by a 165 h.p. Napier Javelin IA, the aircraft was fitted with a 200 h.p. D.H. Gipsy Six for the 1934 King's Cup race, held that July. 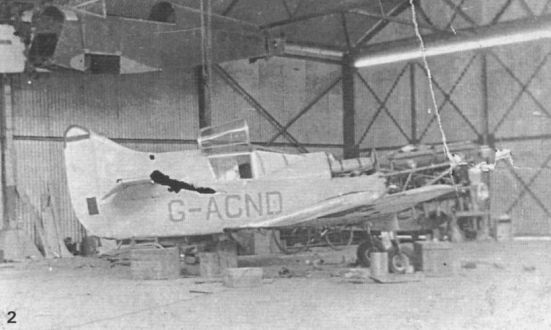 G-ACND crashed near Angouleme in France in October 1935. Percival subsequently built a second, completely redesigned Mew Gull, also registered G-ACND. The redesigned Percival Mew Gull, G-ACND is seen in front of the Gravesend control tower. Built in 1935, 'ND competed in that year’s King's Cup race, coming sixth with an average speed of 209 m.p.h. It was the first aircraft to exceed 200 m.p.h. in this event. It was burnt at Luton after the war. Percival Mew Gull G-AEXF is one of the most famous British racing aeroplanes of all. This photograph, probably taken in 1937, shows the Mew after early modifications made by Essex Aero during that year. 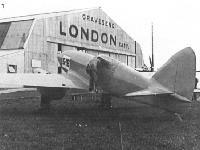 Another view of Comet racer G-ACSS shows it on trestles in the Essex Aero hangar at Gravesend. This aircraft is being reassembled at BAe Hatfield at the time of writing. 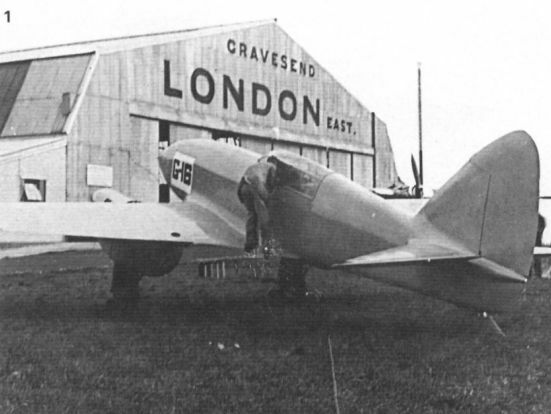 Photo shows the D.H.88 Comet racer at Gravesend, where it was rebuilt by Essex Aero Ltd after a landing accident during Air Ministry trials on September 2, 1936. Painted pale blue and named The Orphan, the Comet took part in the 1937 Marseilles-Damascus-Paris air race. Flown by A. E. Clouston and George Nelsen, 'SS came fourth. Comper Swift G-ABWE was owned by Stan Lowe from September 1935 until June 1938; previously it had belonged to Richard Shuttleworth. Lowe raced WE extensively, and the ugly cowling covering the Pobjoy engine was added in an attempt to squeeze extra speed from this popular racing aircraft. WE was sold abroad in 1940.